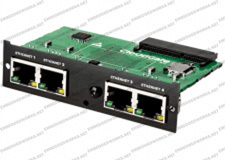 This is the 4-port Ethernet Switch expansion module for the Cloudgate router, which adds 4 RJ-45 ports. Just remove the cover plate on the router and plug this board in. Some modules are auto-configured, and some require configuration in the router setup menu.